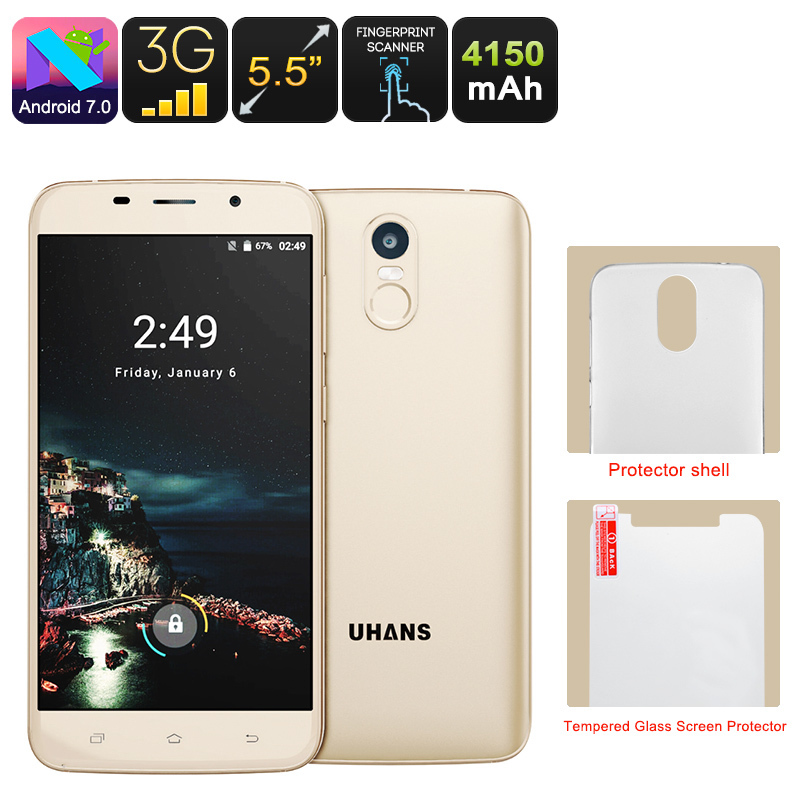 Successfully Added Uhans A6 Android Phone - Android 7.0, Dual-IMEI, Quad-Core CPU, 2GB RAM, Google Play, 5.5 Inch HD Display, 4150mAh Battery to your Shopping Cart. The Uhans A6 is a cheap Android phone that brings forth an exceptionally smooth performance. Running on an Android 7.0 operating system, this Chinese smartphone treats you to the latest software features available on the market. You’ll be able to enjoy the most up to date Applications, play games, and watch movies. Nothing is too much for this affordable Android phone. On its stunning 5.5-Inch HD display, you’re guaranteed to undergo a crisp visual experience. Thanks to its IPS technology, you can enjoy vivid color, high-detail, and sharp images no matter your viewing angle. With its affordable price and durable design, this Android phone is a great first-time smartphone for your child or elderly family member. By supporting 2 IMEI numbers, the Uhans A6 brings along great connectivity. You’ll be able to be connected to two network providers at once. This lets you be reachable on two phone numbers at the same time while using merely one device. If you’re looking for a way to separate work and private life, this Dual-SIM Android smartphone offers the perfect solution. Additionally, your cell phone supports WiFi and 3G data. This means that you’ll always be able to stay online no matter where you’re at. Make online calls, engage in games, and stream movies. Everything is possible with this cheap Android phone. Packed within its body, you will find sophisticated hardware that includes a Quad-Core processor and 2GB RAM. Additionally, your phone supports 16GB internal memory that can be extended via its 64GB SD card slot. With its 4150mAh battery in place, your Android phone delivers up to 12 hours of continuous usage time. This is enough to get through the most demanding of days without needing to worry about battery life. Simply head out to the Play Store and download your favorite Apps and media. With this cell phone at your side, you’ll be treated to hours’ worth of mobile entertainment and will never have to experience boredom again.